Nowadays, everything is designed to be conveniently portable and compatible for a flexible and dynamic lifestyle. Nearly everyone owns a tablet or a Smartphone and of course, one of its nifty functions is to play music conveniently. A myriad of music player for Android is available on the Google Play Store, but which among these free, user-friendly apps is the best? Let’s see. An application by Mobile_V5, this handy music player has a simple yet comfortable user interface and is able to play music files from the user's’ own storage. Its navigation settings are highly customizable and can be personalized to make it easier to access a user’s music. It is also compatible with every known music file format and is equipped with an excellent equalizer. It also accepts lyric files and links it to the music source files. It is compatible with Bluetooth output devices and even has a Shake-It feature which causes the music player to shuffle to the next song whenever the device is shaken. This app may have a noticeably smaller user population but it has a higher user rating. Most of its users prefer it over its competitors because of the absence of advertisements popping up and interrupting their listening experience. It has a straightforward and minimalistic interface as well as a built-in equalizer with a surround virtualizer that enhances the quality of the music. This app has a remarkably high rating of 4.5 stars on Google Play and is definitely among the best music player applications available. This application’s edge over its competitors is its large lyric catalog. 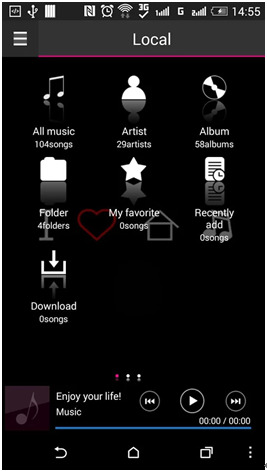 Musixmatch enables users to look up their favorite songs and tracks merely by typing the lyrics they are familiar with. No more scrolling down on search engines for song titles and artists from vague lyric snippets. Another amazing feature of Musixmatch is its ability to identify songs and tracks from external audio sources such as nearby radios, television sets, as well as other Android devices. Make no mistake: Musixmatch also has an equalizer and its interface for playing music is easy to master. It also boasts a high rating of 4.5 out of 5 stars on Google Play Store with mostly positive reviews from its numerous users. The Music Player for Android is said to be the original Android audio player. It provides users with the standard playback functions such as Quick Search, Party Shuffle, and Playlist building. It has a clean interface as well and one that is aesthetically inviting to its users. 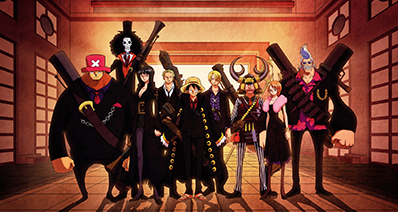 It has over 149,000 users and has a good rating of 4.0 out of 5 stars on Google Play Store. 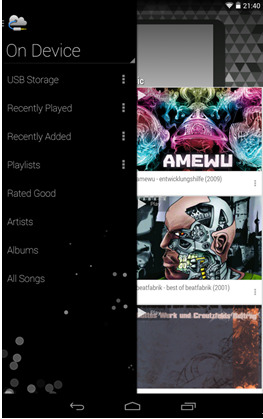 This music player application has a stylish interface with a classy minimalist design. It also supports a wide range of music file formats such as FLAC and WAV and is equipped with a powerful 5-band equalizer. Although it does not yet enable users to download tracks directly, its high-rating and positive user feedback makes it one of the most recommended music player apps on the internet. When it comes to accessing music files from the cloud, SoundCloud is the most prominent app available. 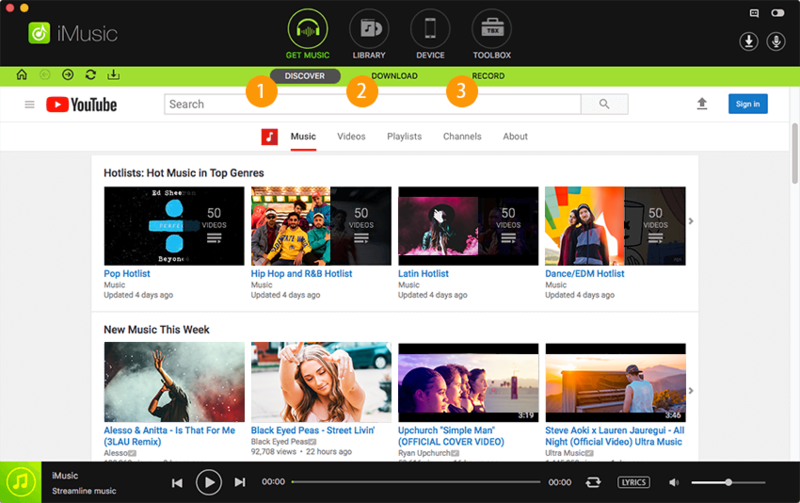 It has a state-of-the-art search engine that enables users to directly find songs and tracks based on artist, genre, and even other users. It is equipped with the basic music player functions and it enables playback controls from the lock screen of its user’s Android device as well. It can also be linked to Facebook and Google+ accounts, but what sets SoundCloud apart from other cloud music players is that it enables users to record their own tracks and share it with others. 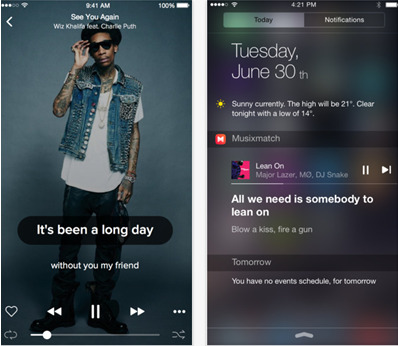 Beat is a music player that adjusts to its users preferences. Its cloud storage is versatile and has floating control settings that can enable it to be easily accessed over other apps. The simple structure of its directories such as folders is rarely found on other Cloud music players. Designed from users’ feedback, most of Beat’s features are customizable to its users. 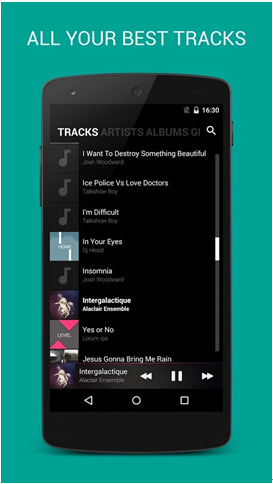 It has over 11 thousand users as of now and is rapidly gathering pace in the industry of Android music players. It also has a highly satisfactory rating of 4.0 out of 5 stars on Google Play and the reviews it has received from its users have been generally positive. With nearly a million users and a blistering app rating of 4.6 out of 5 stars on Google Play Store, Poweramp is definitely a superb music player that has earned its reputation. It supports nearly all known file formats for music and is equipped with nearly all the useful features of all its competitors. Developed by Max MP, a top developer, this is the go-to for music player application for new users and others who remain unsatisfied with their current application. With the rather well-known exception of Taylor Swift, Spotify has a pretty expansive database of artists and songs to choose from and has earned its reputation as an online music player. Users can look up songs based on title, album, artist, and cover alike. It even allows users to conveniently access the lyrics of the songs immediately. The quality of the songs is immaculate as these files are provided by the artists’ verified accounts. What sets Spotify apart is its wide selection of songs and covers and its Premium version even allows users to download the songs onto their devices and listen to them even in offline mode. Ad-free and equipped with more extensive playback functions; Fusion Music Player is another application highly recommended. It has a simple user interface with an intuitive search engine for instant online access to online music. For an online music player, it possesses a number of useful features usually found on offline music players. These features include a Level 12 equalizer that can provide 3D Surround Sound quality for headsets. And on top of all this, it is free of advertisements! Its rating on Google Play is a notably high 4.2 and has YouTube integration to further enhance users’ listening experiences. Google is ubiquitous in today’s software application industry. 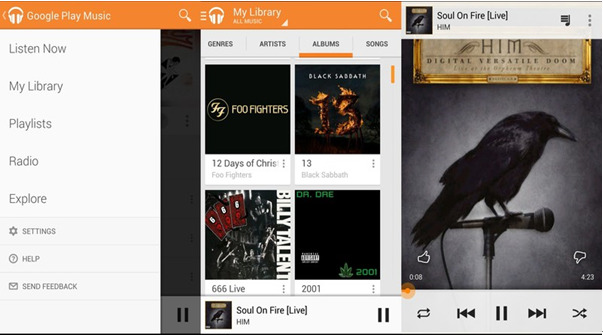 Google Play Music is an app they developed to cater to Android users who enjoy listening to a variety of tracks. It allows users to store up to 50,000 songs online and on top of that, it can connect to local radio stations. 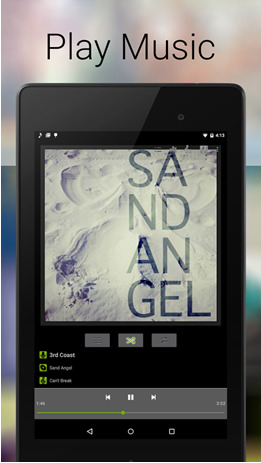 Google Play Music is equipped with all the standard functions widely-patronized music player applications. It has a pretty extensive selection of tracks to choose from; more than 30 million songs are available for its 1.4 million subscribers. As a product of Google, its search engine is also excellent. This application, developed by Turtlerun, has a neat interface and high-definition decoding for common music file formats such as MP3, MP4, M4A, WMA, FLAC, and APE. The music library can be easily accessed and navigated through its Wide Search function. 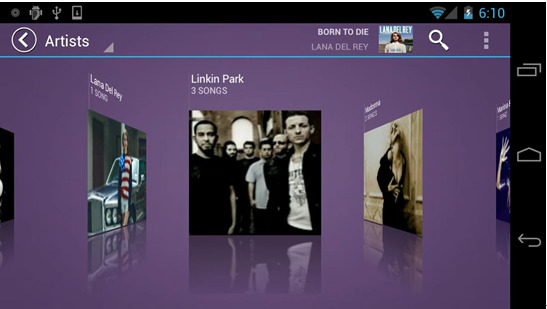 It also has a Smart Playlist which lets its users access their most-played tracks and songs as well as lyric support. What sets Turtlerun’s Music Player for Android apart from other music player applications available on Google Store is its ability to provide high-definition decoding, drastically increasing the quality of music and providing a fresh, new listening experience for people who wish to experience home quality music on-the-go. This multipurpose MP3 player has a lot of uncommon features such as an MP3 cutter, a bass and treble equalizer adjustment in addition to a 5 band graphic equalizer, and different presets to go for different genres of music. It is also takes up only 1.6MB of space and runs pretty quickly as its interface and features are expertly designed to be efficient when it comes to memory and processor usage. It is a simple yet elegant music player and it will definitely work well for users who prefer a straightforward, fast application lacking the excessively slow and heavy features and graphics that encumber listening experience. A professional music player well-suited for high-quality needs. It supports a variety of file formats such as MP3, OGG, FLAC, WAV, APE, WV, TTA, MPC, AIFF, WMA, and AAC. It provides surround sound to Android users and has a 5-band equalizer in addition to a myriad of sound quality boosters such as stereo-widening, reverberate effects, and bass boost effects. It has over 13,000 users and has a remarkable rating of 4.2 out of 5 stars on Google Play Store. iMusic is one of the most widely-recommended music player applications for Apple users. In addition to being a superb music player, it is also able to record unlimited free music from other music players such as Spotify and Google Play Store and can even record and extract the audio from YouTube videos, enabling users to access some content only found on videos posted on YouTube. When it records tracks from other applications, the program also conveniently removes the advertisements from the recorded tracks. It also supports more than 500 radio stations and is overall one of the best music player applications available online. - It is available to customize the MP3 audio quality, from low to high quality. 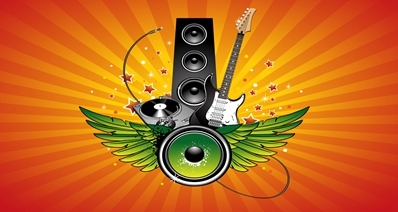 - It can identify the recorded music files quickly and get music information automatically. - It comes with a built-in media player enabling you to play and check the audio quality once recorded.